Hey everyone! We are totally getting ready for fall even though it's been hotter this month then it has all summer! We don't mind the heat because when those fall winds start to make their way in, it will be a relief! We hope this card inspires you and gets you thinking about the end of the summer as well as the start of fall! The picture above features a pumpkin and a crook-neck squash from our very own garden! Hopefully Sally gets her trick or treating in this year! Lets hope she doesn't hang out with that blockhead again! Invitation to a local pumpkin patch! A fall themed lunch with the girls! A fall themed tea party! 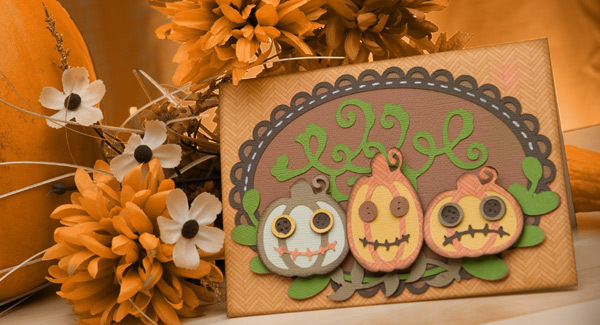 All occasion fall themed Thank You card! The patterned cardstock paper we used for the envelope and card base is from Indian Summer Fall Stack by DCWV (Envelope Not Pictured). Each SVG Collection required to create this layout is listed below. Clicking on the name of each set will take you to our store where you can purchase the necessary files! Note: The SVG dimensions given in the chart show width and height. Size each SVG file to the exact dimensions listed. The buttons are pretty tiny in this project - tinier than they were designed to cut at, really. But it's okay - you'll just need to poke the holes in the buttons with a pin to define them more. 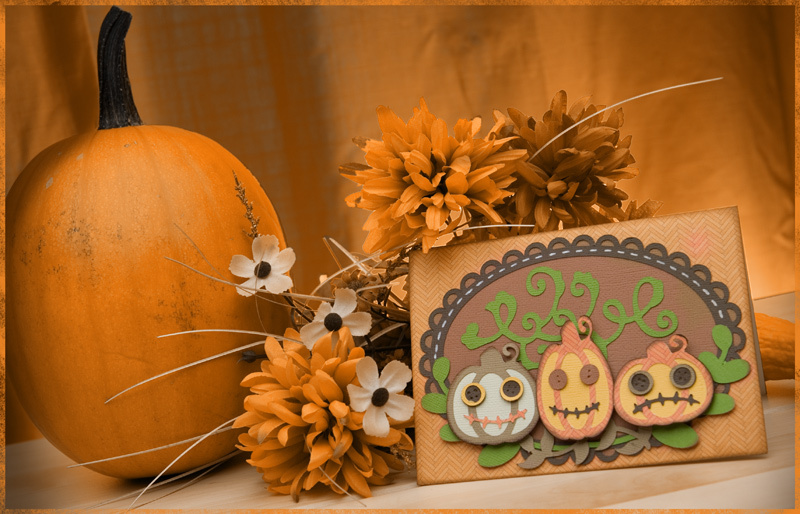 Ink the edges of the card and the pumpkins with a dark brown ink pad. This adds a nice subtle yet super cool feel. If you have a light colored pen that will show up on dark colored paper, such as the White Souffle Pen by Sakura, draw stitches around the top of the oval. That's what we did on ours with our Souffle Pen that we got at Archivers. Use 3D dots (pop dots, glue dots or better yet, 3D Zots) underneath each pumpkin so they stand out. Looks great! Thanks for the stitches Mary. This is a fun project! Great card and thanks for all the ideas to make with it! Love your designs! !